John Oxley‘s Flameaway waited under Chris Garraway to embark on a 1 ½-mile gallop Wednesday morning at Churchill Downs. 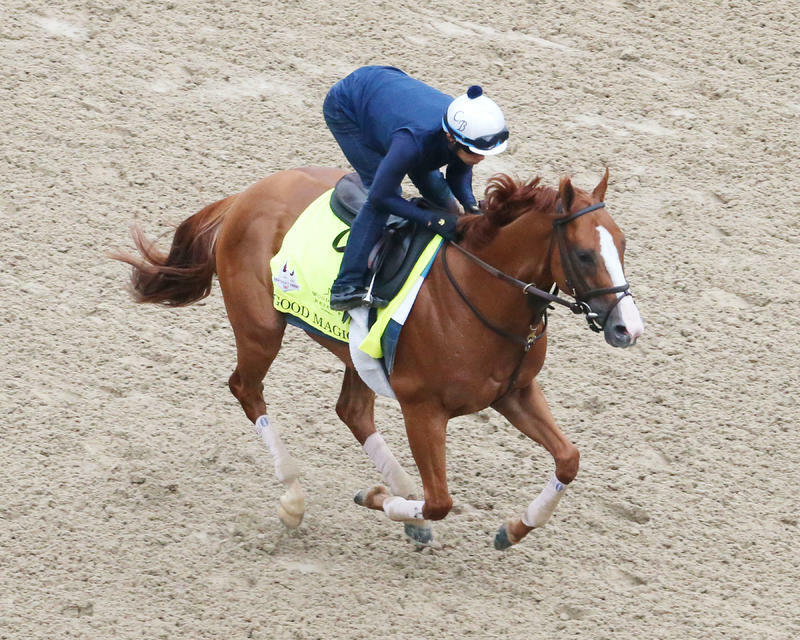 The Mark Casse Kentucky Derby hope is scheduled to work on Saturday. (Coady Photography/Churchill Downs). 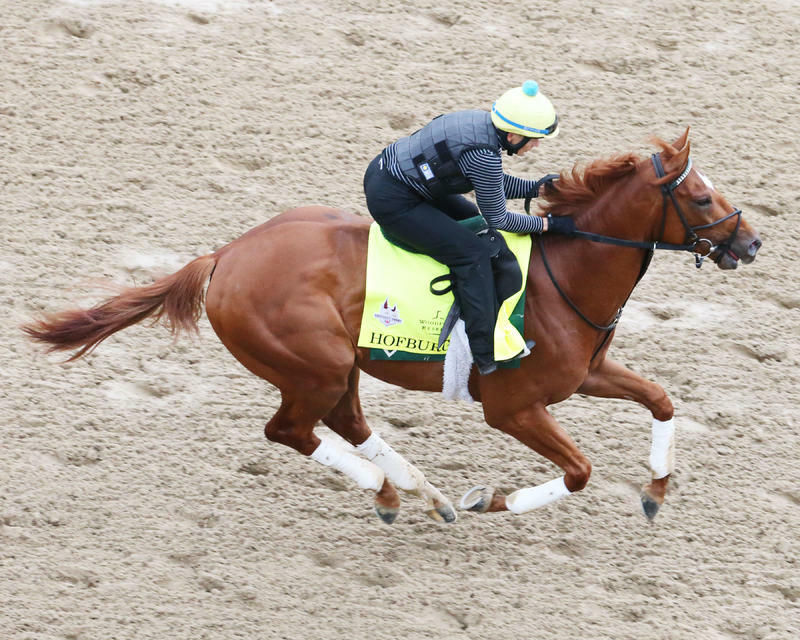 Juddmonte Farms’ Hofburg, runner-up in the Florida Derby (Grade I) in his most recent start, made his first visit to the track at Churchill Downs Wednesday morning as he began his preparations for the 144th Kentucky Derby Presented by Woodford Reserve (GI). Hofburg, who arrived here Tuesday following a van ride from Payson Park in South Florida, galloped 1 ¼ miles over a “good’ track under exercise rider PennyGardiner during the 7:30-7:45 training window for Kentucky Derby and Oaks horses. “I got on him when he came to Gulfstream when he broke his maiden and for the Florida Derby, so I had some familiarity with him,” Gardiner said. Trainer Bill Mott has planned Sunday as the day for Hofburg’s final pre-Derby work. Irad Ortiz Jr. has the mount on Hofburg. No Kentucky Derby works are scheduled for Thursday. However, Courtlandt Farms’ My Miss Lilly is scheduled to breeze a half-mile in the morning in preparation for the Longines Kentucky Oaks (GI). AUDIBLE/MAGNUM MOON/NOBLEINDY/VINO ROSSO – All four of trainer Todd Pletcher’s Derby hopefuls galloped 1 3/8 miles during the 7:30-7:45 a.m. training period reserved for Derby and Oaks horses. Amelia Green was on Audible, who is owned by China Horse ClubInternational, Head of Plains Partners,Starlight Racing and WinStar Farm, NickBush was on Magnum Moon, who is owned by Lawana and Robert Low, Carlos Canowas on Noble Indy, who is owned by WinStar Farm and Repole Stable, and Adele Bellinger was on Vino Rosso, who is owned by Repole Stable and St. EliasStable. The Pletcher contingent is scheduled to work Friday. No rider has been confirmed for Noble Indy. Pletcher’s other riders areJohn Velazquez on Vino Rosso, Luis Saezon Magnum Moon and Javier Castellanoon Audible. BRAVAZO – Calumet Farm’s Bravazogalloped 1 ½ miles Wednesday morning at 7:30 with exercise rider Danielle Rosieraboard for Hall of Fame trainer D. Wayne Lukas. Lukas has not confirmed a jockey for Bravazo. COMBATANT/ DREAM BABY DREAM/RERIDE/ SNAPPER SINCLAIR – Hall of Fame trainer SteveAsmussen reported Wednesday morningthat Risen Star (GII) runner-up Snapper Sinclair would be given some time off and be removed from Derby contention. Also, UAE Derby (GI) third-place finisher Reridecould be pointed to the Preakness (GI) and not the Derby. Both horses were outside the Top 20 on the Leaderboard. Arkansas Derby (GI) fourth-place finisherCombatant galloped 1 ½ miles Wednesday morning at 7:30 a.m. while Sunland Derby second-place finisher Dream Baby Dream(No. 22) trained prior to the exclusive Derby/Oaks training session. FLAMEAWAY – John Oxley‘s Flameaway galloped 1 ½ miles at 7:30 with exercise rider Chris Garraway aboard for trainer Mark Casse. Casse is scheduled to be here Saturday when Flameaway is scheduled to have his final pre-Derby work. Jose Lezcano has the Derby mount. FREE DROP BILLY/PROMISES FULFILLED – Albaugh Family Stables’Free Drop Billy galloped 1 ½ miles underJuan Segundo with and Robert Baron’s Fountain of Youth (GII) winner Promises Fulfilled, with Faustino Herrarte aboard, following with his 1 ½-mile gallop. Both horses are expected to breeze Saturday, according to Romans. GOOD MAGIC – Eclipse Award winner Good Magic galloped 1 ½ miles underWalter Malasquez at 7:30. Owned by e Five Racing Thoroughbredsand Stonestreet Stables, Good Magic is scheduled to work Saturday according to trainer Chad Brown. Jose Ortiz has the mount on Good Magic. LONE SAILOR – G M B Racing’s Louisiana Derby (GII) runner-up LoneSailor galloped 1 ¾ miles at 7:30 a.m. under exercise rider Maurice Sanchez for trainer Tom Amoss. The colt is scheduled to breeze this week, according to Amoss. MY BOY JACK – Don’t Tell My WifeStables, Monomoy Stables and West PointThoroughbreds‘ My Boy Jack jogged two miles under exercise rider Peedy Landry at 7:30. Trainer Keith Desormeaux is expected to arrive in Louisville from Ocala, Florida, sometime Thursday with a work scheduled for My Boy Jack on Saturday. Kent Desormeaux has the Derby mount on My Boy Jack. SHAPING UP: THE KENTUCKY DERBY – Likely starters in the 144thrunning of the $2 million, Grade I Kentucky Derby Presented by Woodford Reserve to be run for 3-year-olds at 1 1/4 miles on Saturday, May 5: Audible (jockey Javier Castellano), Bolt d’Oro (Victor Espinoza),Bravazo (TBA), Enticed (Junior Alvarado),Firenze Fire (Paco Lopez), Flameaway(Jose Lezcano), Free Drop Billy (Robby Albarado), Good Magic (Jose Ortiz),Hofburg (Irad Ortiz Jr.), Instilled Regard(TBA), Justify (Mike Smith), Lone Sailor(James Graham), Magnum Moon (Luis Saez), Mendelssohn (Ryan Moore), My Boy Jack (Kent Desormeaux), Noble Indy(TBA), Promises Fulfilled (Corey Lanerie),Solomini (Flavien Prat), Vino Rosso (John Velazquez). Next up in order of preference: Blended Citizen (Kyle Frey), Dream Baby Dream(TBA), Restoring Hope (TBA), Sporting Chance (TBA), Givemeaminit (TBA) andPony Up (TBA). BLAMED – Cleber Massey’s Sunland Park Oaks winner Blamed visited the starting gate and then galloped 1 ½ miles under LuisRojero during the 7:30-7:45 training window for Kentucky Derby and Oaks horses. Marr said Blamed probably would work Saturday. Ken Tohill has the Oaks mount. CHOCOLATE MARTINI – Double Doors Racing’s Fair Grounds Oaks (GII) winner Chocolate Martini walked trainer Tom Amoss’ Barn 29 shedrow Wednesday morning following her five-furlong breeze in 1:03.40 Monday morning. The filly is expected to train Wednesday prior to the 7:30 a.m. Derby/Oaks training period. CLASSY ACT/PATRONA MARGARITA – Carl Moore Management’s Rachel Alexandra (GII) runner-up Classy Actgalloped 1 ½ miles at 5:30 a.m. Tuesdaywith exercise rider Simon Camacho aboard for trainer Bret Calhoun at 6:45 a.m., Camacho was aboard Craig Upham’s Ashland (GI) third Patrona Margarita as she galloped 1 ½ miles. Calhoun does not have a rider confirmed for either filly. COACH ROCKS – Roddy Valente, RAP Racing, and West Point Thoroughbreds’ Gulfstream Park Oaks (GII) winner CoachRocks galloped 1 ½ miles for trainer Dale Romans with exercise rider Adrian Vincencio aboard. Coach Rocks is scheduled to breeze Saturday. HEAVENHASMYNIKKI – LooochRacing Stables‘ Heavenhasmyniiki galloped a mile and a half under JakeRadosevich for trainer AnthonyQuartarolo. Third in the Davona Dale (GII) in her most recent start, Heavenhasmynikki stands 17thon the Oaks leaderboard. The Oaks is limited to the top 14 point earners that pass the entry box Monday. Heavenhasmynikki is scheduled to work in company Friday morning. 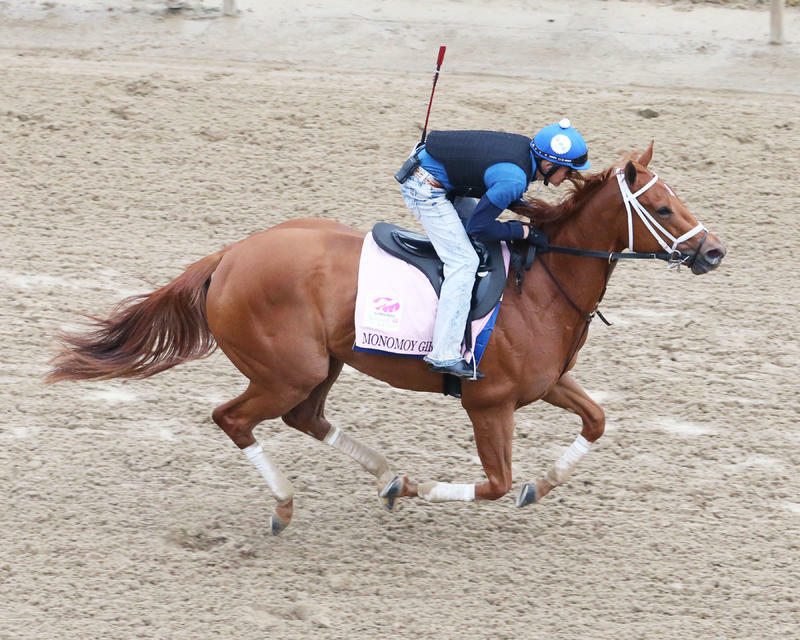 MONOMOY GIRL/SASSY SIENNA/KELLY’S HUMOR – Monomoy Stablesand Michael Dubb’s probable Kentucky Oaks favorite Monomoy Girl galloped 1 5/8 miles Tuesday morning at 7:30 for trainer Brad Cox with regular exercise rider David Garcia aboard. Monomoy Girl’s stablemate, Medallion Racing and Jerry McClanahan’s upset Fantasy Stakes (GIII) winner Sassy Siennaalso galloped 1 5/8 miles at 7:30 with Edvin Vargas up. Both fillies are on target to breeze Saturday, according to Cox. Needing four defections to get in the Oaks field at No. 18, Ike and Dawn Thrash’s Kelly’s Humor galloped 1 ½ miles. MY MISS LILLY – Courtlandt Farms‘ My Miss Lilly walked through the paddock and then galloped 1 ¼ miles with EmersonChavez aboard. Trainer Mark Hennig said Chavez would be aboard Thursday morning when My Miss Lilly is scheduled to work a half-mile. Joe Bravo has the Oaks mount. 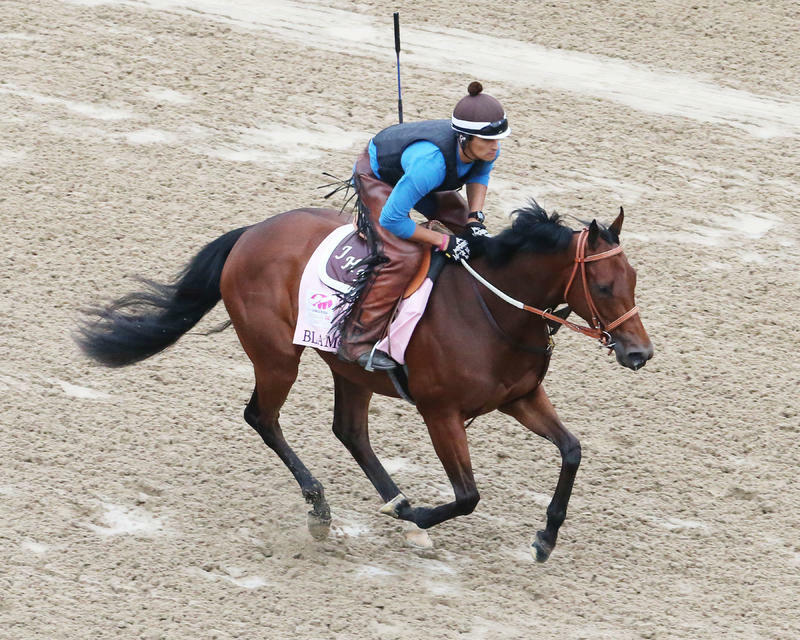 WONDER GADOT – Gary Barber‘s Wonder Gadot galloped 1 ½ miles under exercise rider Orlando Cross for trainer Mark Casse. Wonder Gadot, who will be ridden in the Oaks by John Velazquez, is scheduled to work Friday. SHAPING UP: THE KENTUCKY OAKS– Likely starters in the 144th running of the $1 million, Grade I Longines Kentucky Oaks to be run for 3-year-old fillies at 1 1/8miles on Friday, May 4: Blamed (jockey Ken Tohill), Chocolate Martini (TBA),Classy Act (TBA), Coach Rocks (Saez),Eskimo Kisses (TBA), Midnight Bisou(TBA), Monomoy Girl (Florent Geroux),My Miss Lilly (Joe Bravo), Patrona Margarita (TBA), Rayya (Drayden Van Dyke), Sassy Sienna (Gary Stevens), Take Charge Paula (TBA), Wonder Gadot(John Velazquez). Next up in order of preference: Red Ruby(TBA), Exuberance (TBA),Heavenhasmynikki (TBA), Kelly’s Humor(TBA).